Despite a previously canceled rail tunnel project, New Jersey commuters might receive an alternative mass transit route, after all. Photo by Tambako the Jaguar. Yesterday, the U.S. Senate approved a funding measure that includes a minimum of $15 million for Amtrak to begin design and engineering measures on a proposed railroad tunnel project to connect New Jersey and New York. The Gateway Tunnel project, which would extend from New Jersey’s Secaucus to Manhattan’s Penn Station, is one of two ideas to expand mass transit in the area. The other proposed idea is to extend New York City’s number 7 subway line to Secaucus, reports Newsroom Jersey. New Jersey Governor Chris Christie canceled the previously planned Access to the Region’s Core (ARC) Tunnel project in October 2010, a $9.8 billion commuter rail tunnel that would similarly offer alternative commuting options for the region. Christie cited potential cost overruns and poor connection to alternative mass transit routes as reasons for the cancellation. New Jersey Senator Frank Lautenberg had secured $3 billion in federal funding for ARC prior to Christie canceling it. Despite canceling ARC Tunnel, Christie showed support for the Gateway Tunnel project and the extension of the 7 line. To assess the feasibility of the 7 line expansion, New York City paid $250,000. The project could cost an estimated $10 billion and take a decade to complete, NJ.com reports. The Gateway Tunnel project, on the other hand, is expected to cost $13.5 billion and take nine years to finish. For example, Bent Flyvbjerg has documented average cost escalation of 47% in rail projects and 35% in roads and tunnels. This does not mean that the tunnel is not worthy; it might be according to comments by those involved. But an adequate analysis shall be made, which seems to be happening with this phase of the project, in which detailed studies will be contracted. In the mean time, as the project will take several years, it could be interesting to test additional bus priority schemes, in the Lincoln and Holland tunnels, and the Washington Bridge. They are the best way to improve capacity. A single lane for general traffic moves 2,500-5,000 passengers per hour (depending on the vehicle occupancy). The same lane with buses is able to move 32,600 passengers per hour per direction. Are you a commuter in this region? 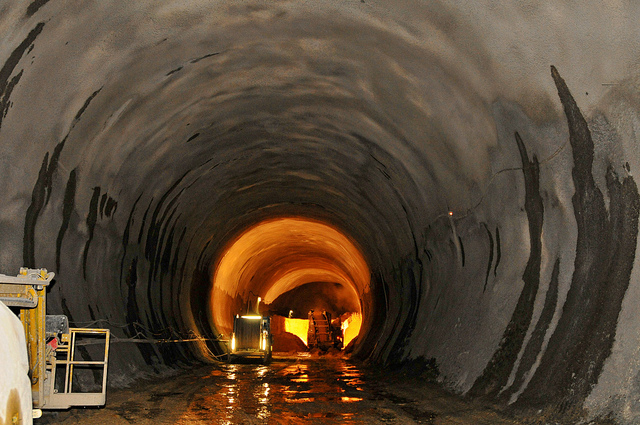 What do you make of the recent developments in the NY-NJ commuter rail tunnel projects? Share with us in the comments section below. Correction, 11/17/2011: An earlier version of this post incorrectly referred to Holland Tunnel as Amsterdam Tunnel.